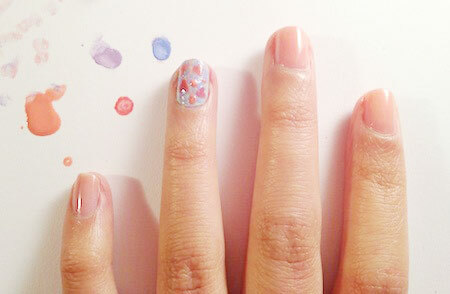 A simple and pretty floral nail art tutorial for spring. 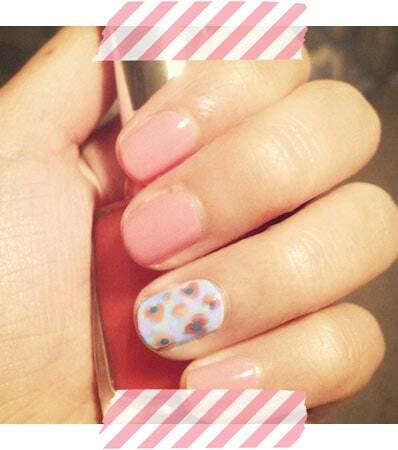 Learn how to do floral nails with our step by step how-to. Now that spring has arrived, I have been enjoying the evident change of weather (SUN!!) over the past few days — despite the crazy allergies that, for me, come with it. I don’t know about everyone else, but living in a city where the gloomy rain dominates most of winter, I get incredibly excited just by the thought of spring. A base color. I used Sally Hansen Xtreme Wear in Mint Sorbet. 2-3 “background” colors, preferably pastels. I chose three shades: Sally Hansen Xtreme Wear in Lacey Lilac, a self-mixed pastel blue (similar to Essie’s Lapiz of Luxury), and Revlon’s Perfect Pink. 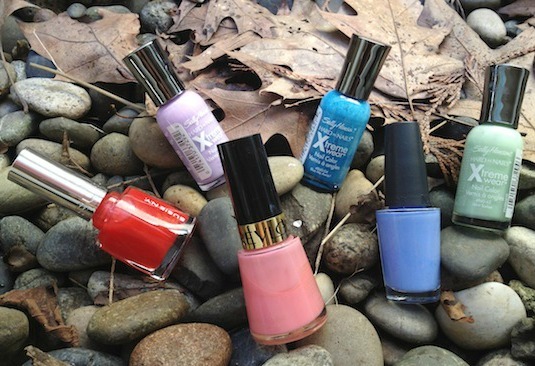 A darker color for the stamen of the flower – I used Sally Hansen Xtreme Wear in Blue Me Away! Paint on your base color. I chose a mint green because it is a subtle shade, but can still be seen through the layers. Remember to let it dry, or you might risk it smudging with the next layer and creating an uneven base. Take your ‘darkest’ pastel color first (for me, this was my light blue), dot a small amount onto a piece of paper, then dip the tip of your sponge into it. 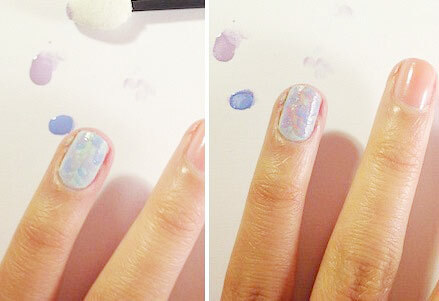 If there is too much color in the initial dip, dab it off on the side before working on your nail. Dot some random spots around your nail. The dots are meant to look sort of messy, so don’t worry about making them perfectly symmetrical or evenly placed. Wipe the leftover color off onto the piece of paper to prepare the sponge for your next color. Take your second darkest color (mine was the lilac shade, on the left) and repeat the previous step. Start overlapping the colors and filling in the empty spaces. After this is done, following the same idea, take your lightest color (pink, on the right) and blend the color into the previous two layers to get a sort of watercolor effect. Take the color you chose for the flowers and — with your dotting tool — make some blobs on your nail by overlapping two or three dots together. This doesn’t have to be neat, but make sure not to make really thick blobs or they will take a long time to dry. 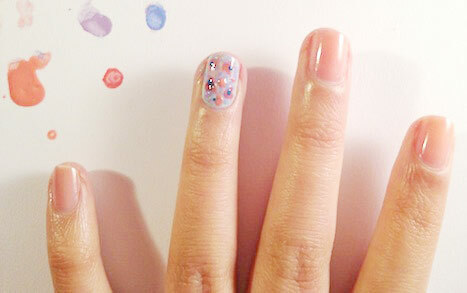 Spread these out on the nail, making sure to create several different sizes. After this is done, use a smaller dotting tool or a toothpick to take a bit of the color for the stamen (I used blue) and lightly dot the middle of the flowers. I decided to just dot the larger ones and leave the smaller flowers alone. At this point, either wait for the design to dry before putting on a top coat or put the top coat on right after, which will allows the colors blend together more to accentuate that watercolor-washed look. I also think a layer of fine glitter polish would also look great with this. Are you guys excited for the spring weather? 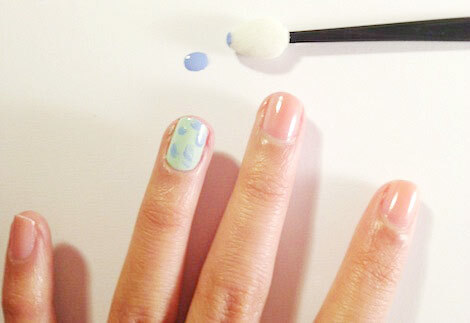 There you have it — spring flower-inspired nails! I hope you guys enjoyed this look, and thanks for reading. What are your go-to colors for spring time? Any questions and comments? And of course, I’d love to know what other types of tutorials you’d like to see here next! Happy Spring! !